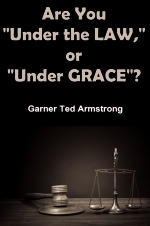 Are You "Under the LAW," or "Under GRACE"? Millions have been asked this question — never realizing that the question itself can be totally MISLEADING! Did you know that millions who think they are "under grace" are actually "under the law" — and don't know it! How many times have you seen or heard these words quoted? Perhaps dozens or even hundreds! But are you sure you really UNDERSTAND these inspired words of the Apostle Paul? First, what do WE believe? Perhaps some few have thought we of the WORLD TOMORROW program, and of the staff of The PLAIN TRUTH magazine, believe in salvation BY WORKS! So, at least, it has been said of us! But we DON'T! WE BELIEVE, THOROUGHLY, EVERY LETTER of that scripture you just read! What's more we DO NOT believe any individual can EVER be saved by keeping any law — whether Ten Commandments, or ANY OTHER law! But what about you? And how can you be sure? How can you come to really KNOW the answer to this vitally important question — one that has aroused almost endless controversy among professing Christians! There is only ONE SOURCE to which you can go! There is only ONE way you can really be sure! That way is to check up — YOURSELF — in YOUR OWN BIBLE! So right now, at the outset of this article, make up your mind to DO JUST THAT! Perhaps you don't really bother to "check up" on most of what you read — either in The PLAIN TRUTH or anywhere else! But just this once — for your OWN satisfaction — CHECK UP! The Apostle Paul urges, "Prove all things, hold fast that which is good!" (I Thess. 5:21). "To the LAW, and to the testimony," orders God through Isaiah, "if they speak not according to this word, it is because there is no light in them" (Isa. 8:20). Be sure you READ each scripture you see quoted in The PLAIN TRUTH, and, for that matter, ANY publication! That way you'll know your belief and your faith does not rest in men, but in the Holy Word of God! The place to begin is to understand the meaning of the terms with which we are speaking! What IS GRACE? This is a vitally important question! Important because your Bible plainly foretold there would be a great conspiracy to deliberately change the meaning of this simple word — make it become CONFUSING to most people — UNCLEAR! Today, there is ENDLESS argument among many religionists over the meaning of the term "grace!" What does it mean to you? Does it imply PERMISSION TO SIN? "Certainly not!" you might answer! Well, then — does it mean you DO NOT HAVE TO KEEP GOD'S LAWS? "OF COURSE!" many would immediately reply! But wait a minute! What IS sin? "Sin IS," the Bible answers, "THE TRANSGRESSION OF THE LAW" (I John 3:4). Well, then — if that's what sin IS, if sin IS the BREAKING OF GOD'S LAWS! SIN is, then, FAILING TO KEEP GOD'S LAWS! It certainly is! Satan and his ministers (II Cor. 11:13) have CONFUSED the meaning of grace in most men's minds! This whole world, according to your Bible, has been DECEIVED (Rev. 12:9; 20:3). Grace Is, according to Webster's New Collegiate Dictionary, "Favor, kindness, MERCY, etc.," and, the ecclesiastical usage, "DIVINE MERCY OR FORGIVENESS!" But forgiveness from what? Why, what is 'a Christian, but one who has, through the shed blood of Jesus Christ, obtained MERCY and PARDON from his past sins? It is through the blood of Jesus Christ we must obtain GRACE! Christ died, then, to show GRACE toward us — didn't He? Paul was inspired to write, "What then? Shall we SIN [that is, shall we BREAK ANY ONE OF GOD'S TEN COMMANDMENTS] because we are not under the law, but under grace? God forbid!" (Rom. 6:15). There is the BIBLE answer! Paul plainly reveals that we must not think we may SIN, that we can ignore, or live contrary to God's Ten Commandments, just because God has shown us some of His great MERCY! WHY did God have to show us His MERCY? Why did we NEED "GRACE?" Every human being has, because of his very nature of basic hostility toward God's laws (Rom. 8:7) been convicted of God's law as guilty of sin! The penalty of sin is DEATH (Rom. 6:23). Christ DIED in order to ERASE OUR PAST SINS! (Rom. 5:8). THAT IS WHAT GRACE IS! It is the unlimited mercy of our God — the unearned, unmerited. PARDON of our God, when we totally repent, of our past sins! Notice it! "In whom (Christ) we have redemption through His blood, the forgiveness of sins, according to the riches of HIS GRACE!" (Eph. 1:7). Even before the close of the New Testament canon, Almighty God inspired Jude to write, "Beloved, when I gave all diligence to write unto you of the common salvation, it was needful for me to write unto you, and exhort you that you should earnestly contend for the faith which was once delivered unto the saints. For there are certain men crept in unawares, who were before of old ordained to this condemnation, ungodly men, turning the grace of our God into lasciviousness, and denying the only Lord God, and our Lord Jesus Christ" (Jude 3, 4). The actual HISTORY of what happened from that time to this is now available! Remarkable, almost unbelievable discoveries are rapidly being made which shall amply PROVE that, true to the prophecies of your Bible, certain men DID creep in "unawares" — men who DELIBERATELY, with planned forethought, attempted to undermine the pure truth of God which was once delivered to the saints. This, remember, was a prophecy of many centuries ago! Jude went on to describe these men as those who had a basic resentment and hostility toward all government, and the symbols of government, those in authority! "Likewise also these filthy dreamers defile the flesh, DESPISE DOMINION, and speak evil of dignities!" (Jude 8). Basically, it is simply this: they have become convinced that a person should live a "righteous life!" They have become convinced that they have been a "sinner" — which usually means a person who has lived an "unrighteous life." To most, an "unrighteous life" merely means having various "worldly" habits and interests, perhaps attending motion picture theatres, dancing, drinking, or playing cards. It may even involve the various modes and styles of apparel. There are dozens of different categories in the minds of men as to what actually constitutes SIN! But whether it involves various of these habits, indulgences, or "worldly acts" — most professing Christians would say that conversion, to them, means "living for God." It means living a "good" life, rather than an "evil" life. It means to think "good" thoughts, rather than thinking "evil" thoughts. In a sort of vague, nebulous way, most professing Christians realize there must be a certain change in their lives when they "repent" or receive, or accept Christ. To repent means to be deeply broken up and sorry over having SINNED! Peter continued, as you read in Acts 3:19... and be converted, that your SINS may be blotted out, when the times of refreshing shall come from the presence of the Lord." Surely everyone of you know that Jesus Christ died for the express purpose of taking upon Himself our sins? Surely you all know, as a matter of basic, practical, Biblical FACT, that the SINNER must call upon Almighty God to apply the sacrifice of Jesus Christ in order to FORGIVE his sins? David, experiencing the real depths of repentance, cried out, "Have mercy upon me, Oh God, according to thy loving kindness, according unto the multitude of thy tender mercies BLOT OUT my transgressions. WHEN you have totally repented and been forgiven, then God says "Let not sin therefore reign in your mortal body, that you should obey it in the lust thereof. Neither yield ye your members as instruments of unrighteousness unto sin, but yield yourself unto God.., for sin shall not have dominion over you, for you are not under the law but under GRACE" (Rom. 6:12-14). Paul goes on to answer a question which might immediately arise in the minds of some who do not know the meaning of the term "grace." He says, in the scripture immediately following the one you just read, "What then? Shall we SIN because we are not under the law, but under grace? God forbid!" (Rom. 6:15). I have heard my father, Mr. Herbert W. Armstrong, say many times "God will not save a single person he cannot GOVERN!" While there is no scripture which says these words directly — there are many scriptures which uphold this basic principle by direct inference. The one you have just read is a very good example. Those who have now come to stand in awe and in fear of the holy LAWS of God, and do now realize they have been convicted of sins in the sight of those laws, have now become totally REPENTANT of having broken those laws, shall BE — as a result of their repentance — justified! Now return to the scripture I quoted at the beginning of this article. "For by grace are ye saved through faith; and that not of yourselves: it is the gift of God: not of works, lest any man should boast." Peter says, "... because Christ also suffered for us, leaving us an example, that ye should follow His steps, who did NO SIN, neither was guile found in His mouth" (I Pet. 2:21-22). Now read these plain scriptures, and come to your own private decision as to what you shall do with them. Jesus said plainly, "... but if you will enter into life, KEEP THE COMMANDMENTS!" (Matt. 19:11). Paul wrote, "Wherefore the law is holy, and the commandments holy and just arid good" (Rom. 7:12). Paul went on to say, "For we know that the law is SPIRITUAL, but I am carnal, sold under sin... if then I do that which I would not, I consent unto the law, that it is good" (verses 14 and 16). "For I delight in the law of God after the inward man" (verse 22). "I thank God through Jesus Christ our Lord. So then with the mind I myself SERVE the law of God; but with the flesh the law of sin" (verse 25). "If you fulfill the royal law according to the scripture, 'Thou shalt love thy neighbor as thyself,' ye do well, but if ye have respect to persons ye COMMIT SIN, and are convinced of the law as transgressors. For whosoever shall keep the whole law, and yet offend in one point, he is GUILTY of ALL!" (James 2:8-10). "And hereby do we know that we know Him, if we keep His commandments. He that saith, 'I know Him,' and keepth not His commandments, is a liar, and the truth is not in him" (I John 2:3-4). "And the dragon was wroth with the woman, and went to make war with the remnant of her seed, WHICH KEEP THE COMMANDMENTS OF GOD, AND HAVE THE TESTIMONY OF JESUS CHRIST! (Rev. 12:17). Can you now come to see? The truly converted Christian is not "under the law OR under grace!" Rather, he is living WITHIN God's law, and has experienced God's loving GRACE in being granted forgiveness for his past transgressions of God's law.